Allen Sherriff is one of the well known Sherriff family who has been prominent in Tasmanian Chopping for many years. He won his first unregistered chop in Lebrina at the young age of 15. IN 1968, he won the Tasmanian 12inch Underhand Championship. He won the points aggregate for the North East in 1971-72. Allen teamed with his brother Algie on three occasions in the 15inch and won them all. In 1975, Allen became President of the North East Axemen’s Association when it was in financial and membership difficulty. By the time he relinquished his position in 1983, the North East boasted more axemen and prize money than any other association in the state. In 1976 along with his brother Algie, they formed the Georgetown Axemen’s club. They ran a successful carnival each year, peaking at $4000 worth of trophies and prize money. This was one of the richest single day chopping events held in Tasmania, drawing 110-120 axemen from around the state and from the mainland. During this time they also established the “winners series”. This consisted of holding night chops at the local Mt George Hotel. This was very popular with the locals and axemen from the Launceston area. IN 1980, Allen travelled to the Adelaide Show where he was successful in the 12 inch standing and 12 inch underhand chop. His biggest thrill came in 1984 when he won the Ron Sherriff Memorial Chop. This was an event which had eluded him for a long time. 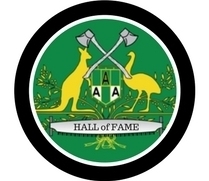 In 1985 he was recognised for his services to woodchopping by being named Tasmanian axemen of the year. Allen spent the majority of his 38 years as an A grade axemen, often cutting off the back mark. Sadly, after a short illness, he passed away aged 53 years old.